I found this recipe on the Food Channel which I adapted to suit our taste. Put the corned beef into a large roasting pan (preferably with a lid). Add the garlic, shallots, pickling spice, caraway seeds, dill, beer and whiskey. Cover and place in the oven. Braise 3 hours, turning the meat once. At the end of the 3 hours, add the carrots, potatoes. Cover again and place back in the oven for an additional 2 hours. Remove from the oven. 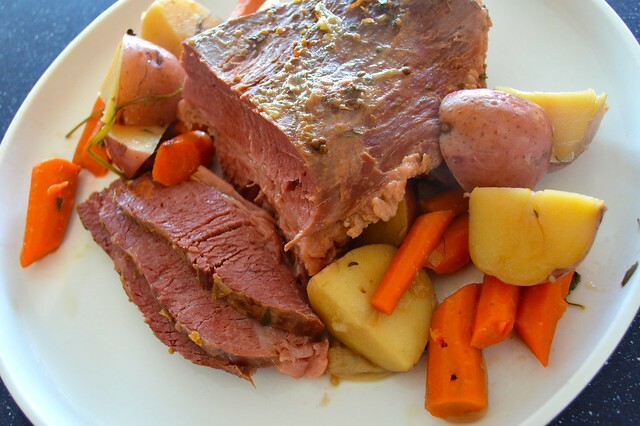 Place the corned beef in the center of a platter and mound the carrots and potatoes around it. 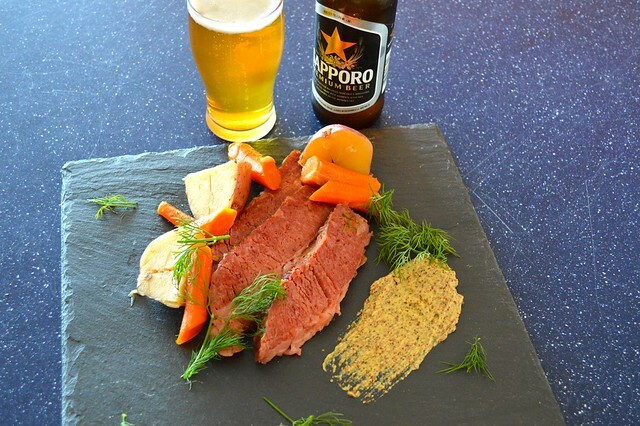 Serve immediately with a cold glass of your favorite Sapporo Beer. 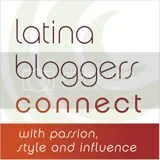 DOUZO MESHIAGARE – BUEN PROVECHO! This entry was posted in Beer, Carrots, Corned Beef, International Dishes, Irish, Japan, Meats, Potatoes, Whiskey. Bookmark the permalink. Looks – and sounds – delicious! Really like second photo with mustard on slate. I think I can eat this all by myself ! Boy, this is making me super hungry this morning! Lol! That looks so succulent and delicious! 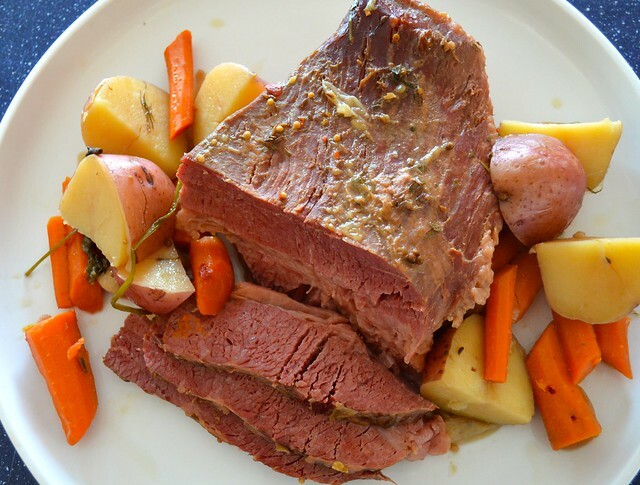 A lovely, creative way to make corned beef. Looks and sounds delicious. Easy recipe that looks so good and I would guess, really delicious! Wow! This is cooked slowly so I imagine the flavors really penetrate all the way. I can’t wait to try it especially with a Sapporo. I’ll let you know how it goes. Make sure you rinse the meat well and do not salt it until after is cooked. The first three hours the liquid will be strong and bitter but the final result the meat will be tender. I would rather next time is cook the potatoes and carrots separately. The couple are perfect!!! Who can imagine you can mix Japan and Ireland!!! You know, I haven’t had corned beef in many years, I think since I moved to Mexico. My mouth is watering!